Graphic designers, rejoice! 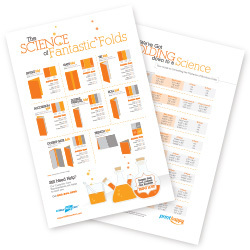 Get diagrams of all 8 folding styles available at 48HourPrint – from Gate to French and everything in-between. The back provides detailed panel dimensions, saving you tons of time and frustration when it comes to the nitty gritty of planning (and designing) brochure projects. Your font choice can make or break your design or layout. 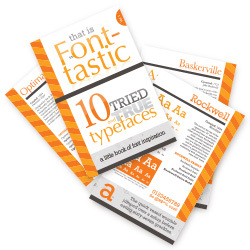 This fun 12-page booklet features10 Tried and True classic typefaces (5 serif and 5 sans serif). Presented in a fun layout that makes it easy for you to compare, contrast and see how they perform at different point sizes, treatments (solid color versus reversed white), core numerals, punctuation display and more. If you like this little book, sign up for our emails and get alerts when more volumes (and fun freebies) are available! 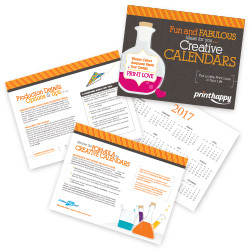 This 6-page booklet is filled with production tips, tricks and resources to help you create the best calendar ever! Here’s to 365 future days of awesome! And if you’d like the 2017 Calendar for Designer and Print Geeks sent to you, see freebie #6! This 26-page booklet is jam-packed with treats, ideas, and inspiration to help bring your holiday designs to life. 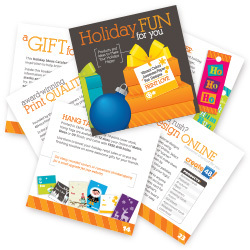 From awesome holiday products, advice on paper and coating choices, and custom options you might like to try … to shortcuts that can save you time, money and headaches during the holidays. Pssst: A bonus treat awaits you on page 25. YAY! Goodies include a sampling of 40 products you’ll love, fun items for your office space, plus valuable resources to help make your life easier! 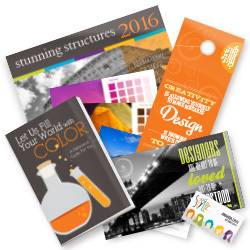 Your kit includes a CMYK Reference poster + companion booklet (your secret weapon for picking color formulas that will look great in print), a comprehensive Paper + Coatings Guide, and top products like business cards, postcards and brochures -- with lots of ideas for your "design file." But wait ... there's more! Founded by designers for designers 14 years ago, our very own in-house designer geeks have gone all-out this year to make your sample kit extra special (including a 2017 Calendar for Designers + Print Geeks, “Keep Calm and Design On” poster, 25-sheet graph paper notepad for doodling your next awesome idea and much more – FREE).Grab yours now if you'd like one!